Coastal environments provide many opportunities for human activities and the potential for economic development. Coasts not only provide attractive environments for tourism but access to the sea for transport, trade and fishing. However, taking advantage of these opportunities can unintentionally cause change within coastal landscape systems. Sediment budgets may be affected and rates of natural processes may be altered. These changes may then require management in order to mitigate their impacts. Mappleton is located on the Holderness Coast of East Yorkshire. The Holderness Coast stretches over 50km from Flamborough in the north to Spurn Point in the south. The coastline consists of low glacial till (boulder clay). Generally, the natural beaches of Holderness are almost always narrow and unable to stop wave erosion. During the winter they have only a thin layer of sand covering the underlying clay, and in high summer the beaches build up enough for recreational purposes. The seabed consists of the glacial mud, sands and boulders, as do the cliffs. At Holderness the environment is primarily one of fetch-limited wind wave development, the dominant wave direction is north-easterly, creating a north-south orientated net longshore current. Waves during normally occurring storm events can reach up to 4 m. Tidal range at the Holderness coast is very high and can reach up to 7 m.
The medium prediction for sea level rise along the Holderness coast is about 30 cm in the next fifty years (6 mm/year). This rate is significantly higher than 1-2 mm/years that have occurred in the previous 100 years. Sea level rise associated with climate change and the prevailing north-easterly wind conspire to make this coast susceptible to rapid rates of coastal erosion. 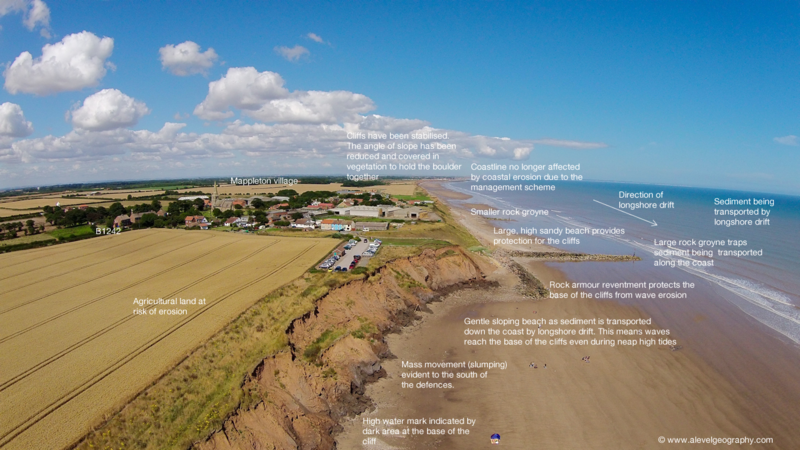 The Holderness Coast has been long recognised as Europe’s fastest eroding. Beaches along the coast comprise mainly of shingle and sand eroded from the clay till. They are narrow as the result of the lack of major rivers bringing new sediment into the coastal budget. Longshore drift tends to transport material south which has resulted in the formation of Spurn Point, a spit formed at the mouth of the Humber Estuary. The 2011 census indicated that the parish of Mappleton had a population of 342, and increase from 249 in 2001. It is located 3 miles south of Hornsea. Mappleton is situated on the B1242, the road connecting towns along the Holderness Coast. This road is of huge economic importance to the area as it provides access to a range of towns and villages for locals. It provides access from smaller villages such as Mappleton and Aldbrough to larger settlements with a wider range of services such as Hornsea and Withernsea. In addition to this the Holderness Coast is a popular destination for holidaymakers and during the summer months, the road is used heavily by tourists. It also widely used by local farmers for access to the rich agricultural land in the area. In 1990, Mappleton was under threat from losing 30 houses and its main road. 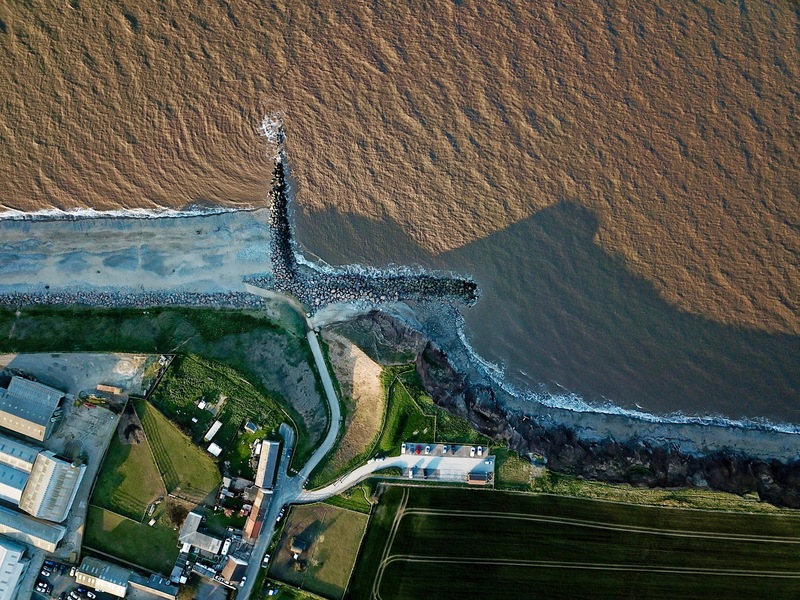 In 1991, sea defences were built in order to protect the village and B1242 main road from intense sea erosion. The Holderness Coast is the most rapidly eroding coastline in Europe. The soft boulder clay cliffs had been eroded at a rate of between 7 and 10 m per year on average. The £2 million project created two large rock groynes to trap materials that are carried in the waves during longshore drift. In addition to this, a revetment consisting of large granite boulders has been constructed. The boulders are placed like a wall in a 450m line of defence along the shoreline. It works by absorbing – not reflecting – wave energy using large air spaces between the boulders and a broad surface area. Revetments are very expensive but long-lasting. These large granite boulders were imported from Scandinavia and deposited by barge along the coast. In order to protect the cliffs along the front of Mappleton from undercutting, their gradient was also reduced artificially. Vegetation was planted on the cliffs to further stabilise them from mass movement. This is known as cliff stabilisation. Longshore drift no longer transports materials along this section of the coast. The construction of the rock groynes has created a larger, higher sandy beach for Mappleton. This means that even at high tide waves do not reach the base of the cliffs along the seafront at Mappleton and the erosion has slowed to a point where it is no longer a threat to the settlement. The rock armour revetment has been very effective in protecting the cliff to the southern end of the settlement. They have been successful in restricting waves from attacking the base of the cliffs here. Cliff stabilisation has had a positive impact in managing the threat of mass movement. There is no evidence of slumping along the area of cliffs where the angle of the slope has been reduced and vegetation has been planted over the last 25 years since they were modified. As the result of the coastal scheme at Mappleton no properties have been lost to the sea and the B1242 remains safe from the risk of erosion. Although the coastal defences have had a positive impact in terms of reducing the rate of erosion and protecting the village and main road, the area directly south of the village now suffers from an even greater rate of erosion. As the movement of sediment has been disrupted due to the construction of the stone groynes material previously feeding the beaches to the south of the Mappleton is restricted. The process of longshore drift continues to transport materials away from the beach to the south of Mappleton but is not replenished as it is trapped by defences at Mappleton. As the result of this the beaches to the south have very little sediment and during low tide expose a combination of sand and clay boulders that have been eroded from the cliffs. This process is called terminal groyne syndrome and happens frequently when groynes are stopped. Owing to the limited beach material waves reach the base of the cliffs even during neap tides. This has led to increased rates of erosion and an increase in slumping. Rates of erosion to the south of the defences at Mappleton have increased significantly since the construction of defences at Mappleton. Prior to the defences being constructed erosion rates were 1.7 (+/-) 0.6 m/yr (1952–1989). Following the construction of defences, they increased to 3.3 (+/-) 0.8 m/yr (1989–2005). Localised rates of erosion in some areas exceed 10m/year. This is evident in the image below. An annotated photograph to show the coastal management techniques used the protect Mappleton and their impact (click to enlarge). The video below shows Mappleton in 2016. Notice the impact of erosion to the south of the coastal defences. You can clearly see the area to the south has very gently sloping beaches and high levels of erosion where the coastal defences stop. The land use to the south of Mappleton is predominantly agricultural. A number of farmers have lost a significant amount of land to increased rates of erosion. Several farms have been completely lost to the sea including Grange Farm and Cowden Farm. Where do you want to go now? View the coasts menu. Find out about soft engineering along the coast. Find out about coastal fieldwork techniques.